The buildings — the barn, stables, and dairy — on Staple Farm in Kent, England were in disrepair. 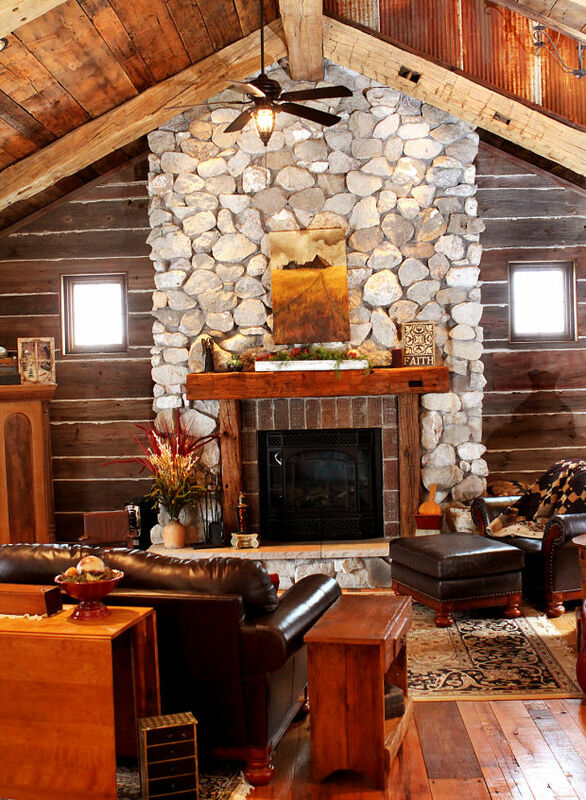 The firm worked to salvage what they could and turn the barn into a home away from home for the couple. Though they wanted to maintain the “barn’s brooding presence,” according to the architects, they added modern amenities like a ground-source heat pump, LED lamps, and security systems. 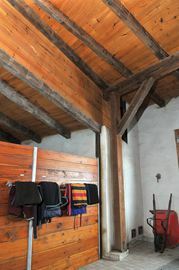 The lights, HVAC system, and security systems are all Internet-connected, so the owners can monitor their barn when they travel. There’s also a fireplace built into the spiral staircase, that leads up to the mezzanine sleeping area. The original stable corridor, which the architects retained, now functions as an elegant enfilade. Until one day when Andy Ramus of AR Design Studio, which was completing renovations to the Manor House, recognized the potential of this historic stable. Shortly after, Lovely Cottage’s stable received a new lease on life as a modern three-bedroom house featuring much of the structure’s original barnlike character. via Manor House Stables, A Champion’s Home Reborn: Remodelista. In an effort to revitalize the Tenney property on Marble Hill Road in Fayston as a working farm and forest in the Mad River Valley, Vermont Land Trust has contracted with Deconstruction Works to remove one of two farmhouses located on the property. 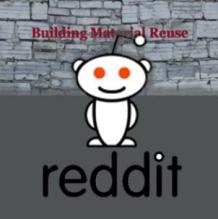 Deconstruction Works is a team of deconstructionists specializing in the salvage and repurposing of the built environment. The team will carefully dismantle, salvage and repurpose components of the red farmhouse located at the top of Marble Hill Road. This undertaking is driven by the significant disrepair of the building and the financial burden that would be transferred to the next farm owner if it were left on the site. via The_Valley_Reporter – Vermont Land Trust removes Tenney house for reuse and farm’s renewal. 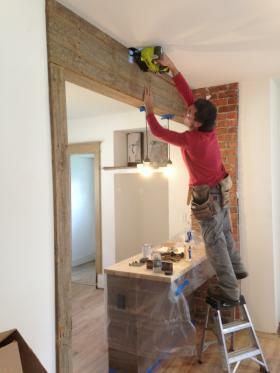 Siobhan Spain’s brother installing reused barn wood in her kitchen. 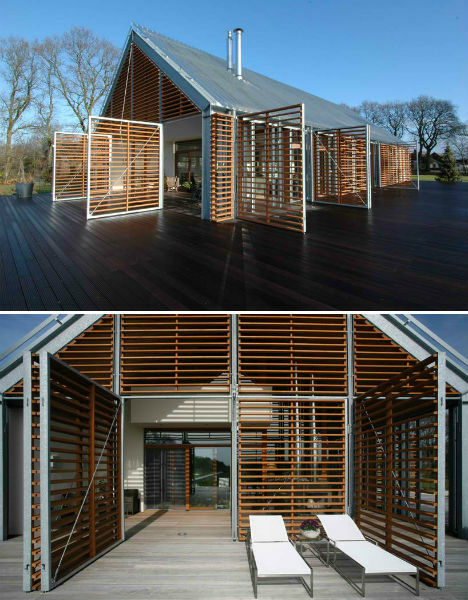 Spain’s family deconstructed their barn instead of demolishing it. 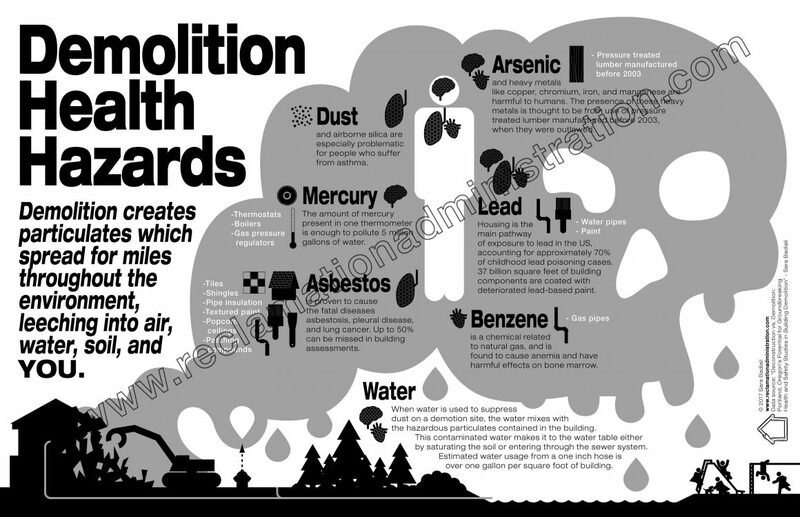 When you demolish a building, it gets torn down as quickly as possible without regard to what happens to the discarded materials. When you deconstruct a building, you take it apart piece by piece and try to resell or reuse everything you can. 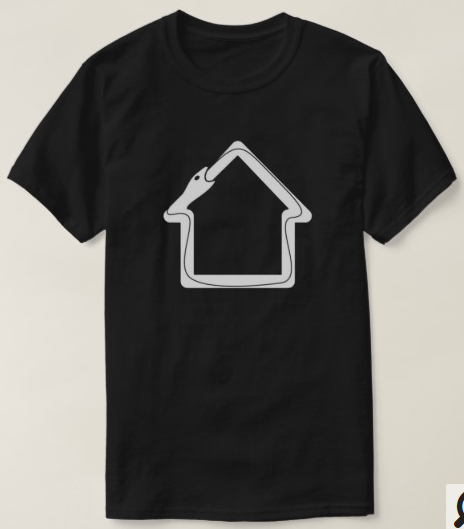 via Choosing Deconstruction Over Demolition | Iowa Public Radio. UK-based architects John McAslan + Partners just finished converting a 1929 stone barn into a contemporary library and student center at the University of Cumbria’s Ambleside campus. via John McAslan + Partners Convert a 1929 Stone Barn into a Luminous Student Center | Inhabitat – Sustainable Design Innovation, Eco Architecture, Green Building. The show’s theme is “keeping it local,” and that fits right in with what the Carlsons do. 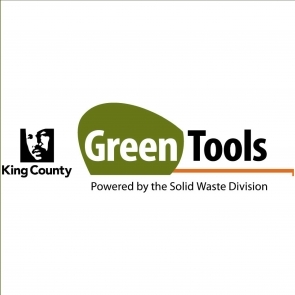 They salvage materials from a roughly 100-mile radius and re-mill the lumber in a shop on their property, employing several full- and part-time workers. But from there the Carlsons cast long lines, selling to homes and businesses, particularly restaurants, all over the country, and even overseas. Pictures of high-end homes incorporating their products, particularly in Colorado and California, are posted on their website. When the Carlsons started, they mainly sold raw barnwood and other artifacts that could be used as “decor.” But in 2001, they began manufacturing reclaimed flooring, and that has become their biggest product, Lanette said. via 2nd time around: Barn salvage becomes flooring, decor. It’s anything but your regular horse barn. The 20-stall rounded stable and accompanying riding arena is built almost entirely of recycled and reclaimed building materials. Mr. Jewett says the idea originated from his wife Brenda Gallie’s love for horses and a mutual interest in sustainable architecture. via Hop Hill Stables a crown jewel of reclaimed material in Uxbridge. 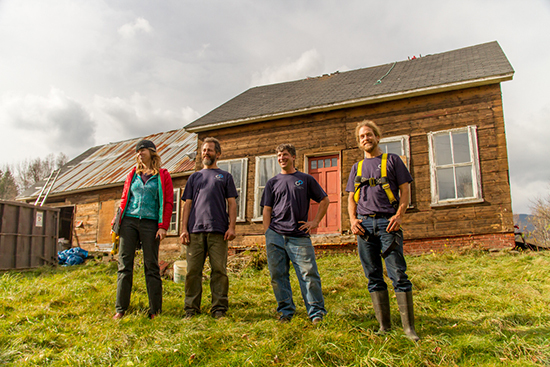 Our friend and carpenter Mike Dyke bought a beautiful barn, which felt into ruins. Piece by piece, element by element was demounted and set to repair and placed back. 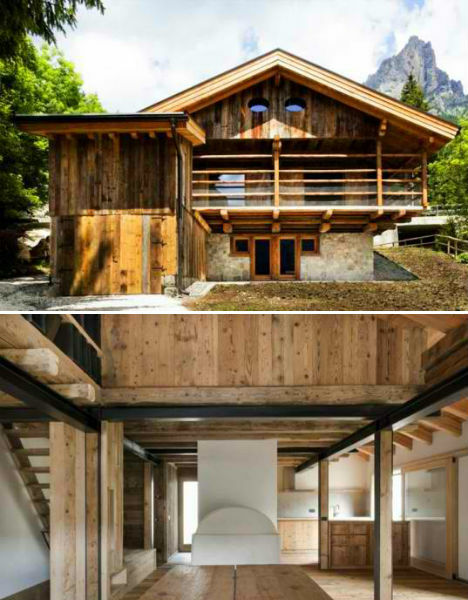 This project is a result of the team´s total dedication to wood, to tradition, to handcraft and details. We call this joint venture «labor of love». So choosing to build a house by reconstructing an old barn and outfitting it with things like salvaged brick and torn-up sidewalks was hardly out of character for them — even 25 years ago, before reclaiming architectural salvage became trendy. The couple’s home is a 19th-Century barn that Hutter and a crew dismantled and moved from Sharon Township, Ohio. Refurbishing the barn has been Hutter’s passion, a project accomplished a bit at a time over more than two decades. 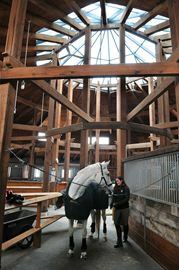 via Cool Spaces: Building a barn into a home | Detroit Free Press | freep.com. 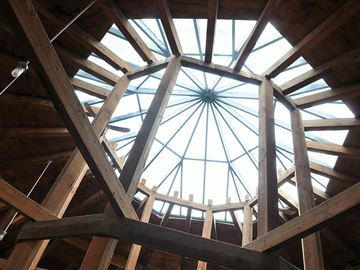 “Rehabilitating the existing barn structure, located in the heart of the 1,100-acre nature center, allowed us to experience cost savings by reusing an available existing structure located where campers would be immersed in nature,” said Jim Nicolow, a principal and the director of sustainability at architecture and planning firm Lord, Aeck & Sargent, which led the design Nature Center’s design effort. via Kalamazoo Nature Camp Expands Through Adaptive Reuse | EarthTechling. Having established a reputation as someone always on the lookout for wood to repurpose, he [Ron Hunt] learns of potential treasure troves of old wood through word-of-mouth, keeping an open eye and online. He bought a barn about to be torn down in Hershey, Pa., on eBay. “I’m trying to salvage and repurpose old wood and keep it alive,” he said. “It’s part of our history. The old barns are disappearing every day. It’s something future generations are never going to see if we don’t preserve it. It’s our ancestor’s history. It’s our country’s history, and it’s important to preserve. via American Treasures highlights local artisans, reclaimed pieces – The Herald Dispatch. An urban expansion is planned for the area, and part of the reason for the renovation was to strengthen the environment and quality in which the barn sits. The firm Arend Groenewegen Architect was called in to make the changes. 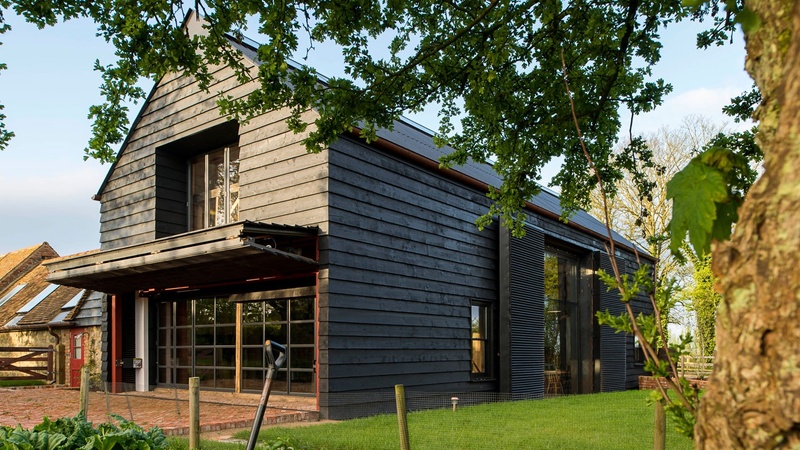 via Flemish Barn Renovation Brings New Life to Historic Village | Designs & Ideas on Dornob. Ann liked the fact that the lumber would be used, but letting the barn go pained her. She could see all the effort that went into the building’s construction. Details such as the markings on the hand-hewn beams were evidence of all the painstaking, backbreaking work. 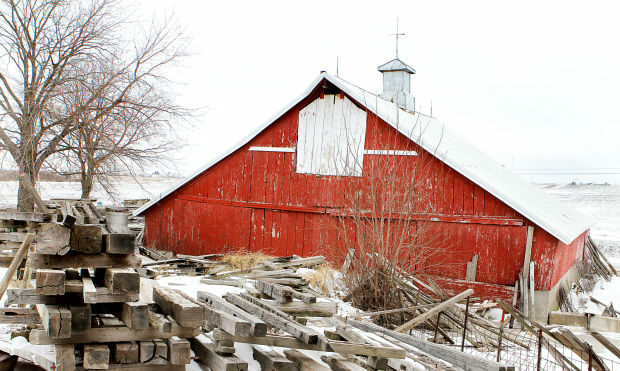 No one knows for sure how many wood-framed and stone-foundation barns there were in Marathon County at the peak of the family farm era, or how quickly they are disappearing. But according to an agriculture census survey, in 2007 the county was home to 1,267 standing timber-framed barns built before 1960.
via Wanted: Wisconsin’s lovely old timber barns | Sheboygan Press | sheboyganpress.com. Recovered wood, or wood salvaged from old barns, buildings, and other places, has become more valuable than ever. This wood is often used in many everyday products—from furniture making to home construction and renovation. Learn the basics of salvaging wood from a reclaimed wood specialist and give something old a new life. via Repurpose Rustic Barn Wood – YouTube. Urban Tree Salvage – Salvaged and reclaimed live edge slab wood tables. May we introduce to you Urban Tree Salvage from Toronto, Canada. Oh, and their amazing live edge tables. Our reclaimed lumber and timber come from a variety of local sources. Barns across Ontario are slowly falling down if they have not been repaired from years of non-use. Ontario barns that were built many years ago were all constructed with locally grown trees that were harvested from the build location and made into lumber. The hardiness zone of the barn as well as the date the barn was built usually dictated what material was used for construction. Reclaimed barnboard is typically made of pine, hemlock and spruce and is offered in grey board, brown board, red board and threshing. Urban Tree Salvage also recycles demolition and construction waste such as excavated historical timbers that were discovered when building condominiums in downtown Toronto and reclaimed building timbers that were salvaged from old buildings around Ontario. Urban Tree Salvage reclaims these materials and sells them as raw lumber and furniture such as reclaimed dining tables, reclaimed coffee tables, reclaimed console tables and reclaimed benches. via salvaged and reclaimed live edge slab wood tables..
Craig Campbell and other Saskatoon artists are hoping city officials reconsider a plan to demolish the downtown bus barns. “These are well-maintained, great buildings. The city wants to bulldoze them,” Campbell said. As part of the major overhaul of the city’s north downtown sector, the tentative plan calls for demolition of the bus barns in favour of a park or other green space. Campbell said park space would not be well-used, and instead he would like the barns “repurposed” into a gathering place to promote the city’s art, music and culture. via Artists want to reuse bus barns. Aging barns are often left to simply deteriorate, the stone crumbling, weathered wooden siding falling to the ground. But in their dramatic A-frame silhouettes and wide-open simplicity, some architects see the potential for a transformation into a modern, livable residential space. 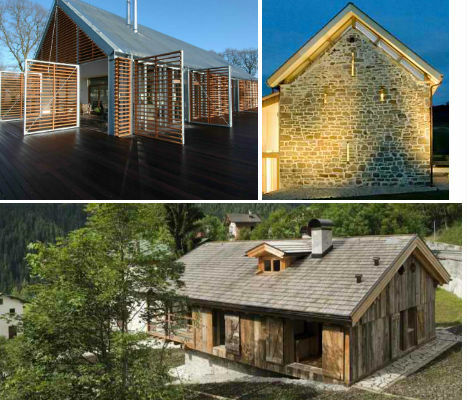 These three barn renovations rescued or recalled structures that were near complete destruction, preserving their history while giving them a greater purpose. 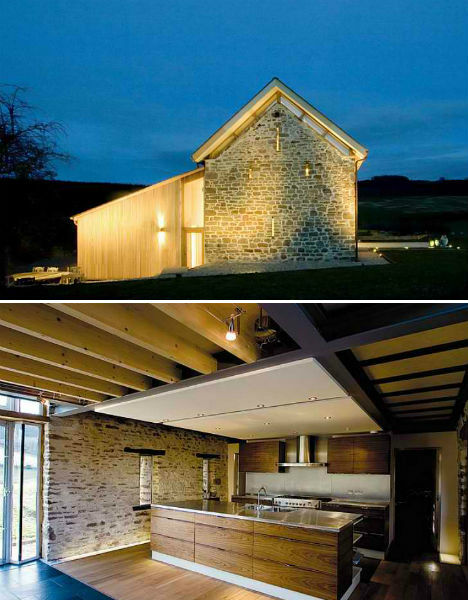 via Rustic Ruins to Modern Residences: 3 Barn Renovations | WebUrbanist. via Weyerhaeuser Now Distributing Reclaimed Wood from Barnwood Industries.